Facebook is set to introduce the new feature for more interesting and active status. This feature will be called Lists and appear in status box options. It has already launched this feature on Tuesday and will be updated on all devices soon. Through this new feature, users will be able to post all the possible activities they have planned by clicking the options. It will engage people more in your timeline by the daily and rapid updates. This will be in What’ on your mind box, by clicking the Lists feature the user will have the list of different things like the traveling plans, activity plans and much more which could be in your mind. It will be the major update in a status of Facebook after the color background update last year. Currently, the status box has different options for color background, polling, answer a question, Emoji and GIFs and not you will have Lists option too soon. This feature will extract more interesting stories from user’s life and activities. People mostly use Facebook to check out the activities of others and they find it interesting. Previously Facebook got updated and gave priority to friends and family stories on celebrity’s stories or other pages which made less use of Facebook. 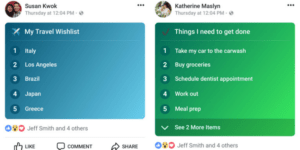 After this, now Facebook might get more interesting due to t this Lists feature which will make people more updated about the present and future planning’s both. According to the research, Facebook lost approximately 2.8 million U.S. users under 25 in 2017 and will lose around 2.1 million more this year. This feature has especially been designed to grab the youngsters again by attracting through updates. The lists feature will surely appeal the youngsters just like the color background done before and it was highly used the feature by the youngsters.